LendingFront, Veridium, and Voca.ai are three of the seven companies recently selected to participate in Mastercard’s startup engagement program, Start Path. The accelerator program works with startups from a variety of fields ranging from banking and biometrics to data intelligence and security. Participating companies will access Mastercard’s worldwide ecosystem and leverage their new relationship with Mastercard and its customers to expand into new markets. Start Path begins with a kick-off event that helps the program administrators get to know the companies, define goals and introduce startups to Mastercard’s partners, as well as future channels and customers. The majority of the program consists of a six-month virtual engagement that companies participate in from their home location. Upon successful completion of the Start Path program, companies that have produced what the program referred to as “tangible value” for Mastercard’s partners will be eligible for potential strategic investment. The full roster of companies also includes Fligoo, mfarmPay, Monsoon CreditTech, and Segasec. LendingFront demonstrated its Small Business Platform at FinovateFall 2016. Founded in 2015 and headquartered in New York City, the company offers an automated lending platform that consolidates processes typically conducted by disparate systems. The technology features application workflow for loan processing, a data engine, decision engine, offer screens, documentation and booking functionality, as well as servicing. LendingFront raised $4 million in Series A funding at the beginning of the year. Massachusetts-based identity and access management solution provider Veridium demonstrated its VeridiumID with 4Fingers Touchless ID technology at FinovateEurope 2017. Earlier this month, the company unveiled its InMotion solution that leverages user behavior analytics to help secure online identities and prevent cyberfraud. Also this spring, Veridium partnered with Blue Turtle Technologies to drive adoption of biometric technology in Africa. Best of Show winner Voca.ai demonstrated its intelligent virtual agent for call centers at FinovateEurope 2019 in February. It was the second Best of Show win for the company, which made its Finovate debut at FinovateAsia last fall. Founded in 2017 and headquartered in Herzliya, Israel, the company’s technology provides a flexible, natural-sounding, automated human voice system that improves customer satisfaction, and helps businesses convert and qualify more leads. LendingFront, Veridium, Voca.ai Join Mastercard’s Start Path. Tango Card partners with StatementGames to deliver e-gift cards as a redemption option for StatementGames players. Terms were not disclosed, but the announcement today that Mastercard has agreed to acquire real-time anti-fraud solution provider Ethoca is another sign of how seriously financial services firms are taking cybersecurity. The deal, which is expected to close in Q2 of this year, will allow Mastercard to leverage Ethoca’s network of more than 5,000 merchants and 4,000 financial institutions to fight digital commerce fraud in general and the challenge of chargebacks in specific. Ethoca’s technology enables merchants to get real-time data when potentially fraudulent transactions are spotted. This empowers merchants to analyze transactions and confirm, stop delivery, and/or reverse transactions before the chargeback process begins. In a statement, Mastercard said that it plans to scale Ethoca’s capabilities and combine them with its own cybersecurity protocols, data insights, and AI-powered solutions to help fight e-commerce fraud. The press release noted a report from Juniper Research that indicated that retailers anticipate losing $130 billion over the next five years due to online fraud. Ethoca demonstrated its Ethoca Alerts solution at FinovateEurope 2016. Founded in 2005, and headquartered in Toronto, Ontario, Canada, the company partnered with French payment system Cartes Bancaires in December. In October, Ethoca teamed up with American Express to help merchants better communicate with AMEX Customer Care during service calls. With investors including Pivot Investment Partners, Spectrum Equity, and Difference Capital, Ethoca had raised $45 million in funding prior to today’s acquisition announcement. Mastercard demonstrated its Cash Pick-Up solution at FinovateFall 2017. Last year, the company teamed up with Vipera to present mobile payment solution, SME-Pay, at FinovateEurope 2018. Fiserv Helps NationalLink Maximize Smart Safe Technology. Mastercard to Acquire Digital Commerce Fraud Fighter Ethoca. Carsharing firm HyreCar leverages identity verification technology from Mitek for its mobile onboarding app. PayPal invests $750 million in Argentina’s e-commerce company, MercadoLibre. Best of Show winner Voleo chosen to participate in Netherlands-based fintech research program. Stash launches Stock-Back, a rewards program to bridge banking and investing. Jack Henry to collaborate with the Zelle Network to launch JHA PayCenter. InComm expands into lottery industry with Linq3 Technologies acquisition. Who knew 2019 would be known as “The Year #Priceless Went Nameless”? Consumers have been conditioned to recognize corporate icons like McDonald’s “Golden Arches” and Nike’s “Swoosh.” Now, with its decision to remove its name from its red and yellow brand mark, Mastercard is the latest major global brand to let a wordless logo do all the talking. The new logo – a pair of interlocking red and yellow circles – will be referred to as the Mastercard Symbol, and will be featured across cards, acceptance marks at online and off-line retail locations, as well as at major sponsorship properties. The move is the second logo change for the company in recent years. 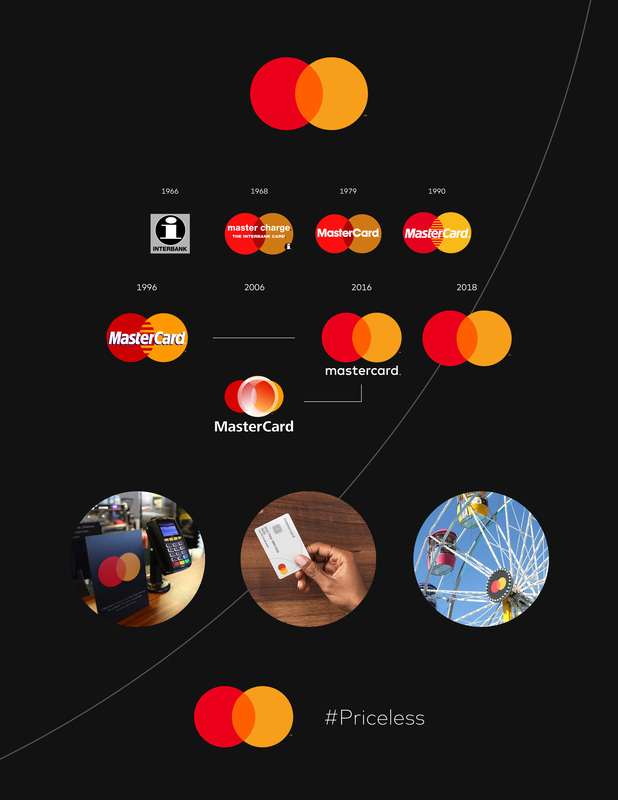 The firm transitioned from “MasterCard” to “mastercard” in 2016, and added design changes that made the logo easier to display both horizontally and vertically. This latest logo redesign was developed by the same firm, Pentagram, that the company turned to in 2016. Founded in 1966 and headquartered in Purchase, New York, Mastercard most recently demonstrated its technology on the Finovate stage last year at FinovateEurope 2018. At the conference, the company partnered with Italian fintech Vipera to introduce a mobile payment solution, SME-Pay, geared toward small business owners. The year before, at FinovateFall 2017, Mastercard demonstrated its Mastercard Cash Pick-Up solution. This technology enables disbursers ranging from P2P providers to NGOs and government agencies to deliver cash to consumers via enabled ATMs without the use of a card. Mastercard trades on the New York Stock Exchange under the ticker “MA” and has a market capitalization of $198 billion. The company connects consumers, FIs, businesses, and governments in more than 210 countries and territories, and reported revenue of more than $12 billion in 2017.